The multimedia work op7 by otolab is an artistic hybrid, born as a multisensorial livemedia show, also able to express its potentialities through the modalities and codes that are typical of the audiovisual installation or of the exhibit. op7 is an ontologically important work, a link between the Italian project tradition and the present research around expressive codes in audiovisual synaesthesy. The exhibit at Traffic Gallery wanted to document and reinterpret one of the best otolab’s live performances, op7. Conceived in 2006 for the Mixed Media festival which took place in the Hangar Bicocca in Milano, it waspresented with a video installation of the work, a tryptich and seven photographic prints taken from the original video material. op7 was a site-specific commission by Marco Mancuso/Digicult within the curatorial work for the Mixed Media 2006 festival, with the aim of inviting the Milan-based collective to dialogue with the I sette palazzi celesti (The seven heavenly palaces) of Belgian artist Anselm Kiefer, seven post-industrial towers that are permanently located in the Hangar Bicocca in Milan. Thanks to a five-screen projection, Otolab set up an optical path through seven audiovisual tunnels of minimal black and white. The multimedia work op7 by otolab – the experimental electronic audiovisual collective – is an artistic hybrid, born as a multisensorial livemedia show, also able to express its potentialities through the modalities and codes that are typical of the audiovisual installation or of the exhibit. Op7 is an ontologically important work, a link between the Italian project tradition and the present research around expressive codes in audiovisual synaesthesy. A cortical centre between accultured electronic music and the modern practices of sampling and digital sound synthesis. A transposition, according to mixed media practices, of the deconstructivist theories of the last century in an interdisciplinary ambit. Commissioned by the Mixed Media Festival in 2006 in Milano, op7 originates as a reinterpretation of a conceptual work of art, the monumental I Sette Palazzi Celesti (The Seven Heavenly Buildings) of Belgian sculptor Anselm Kiefer, to reach its representation using electronic instruments and expressive codes derived from an audiovisual intepretation of optical art. The seven tunnels, the seven paths and gates that separate them, are, in fact, the often cluastrophobic optical element, into which the spectator is forcedly immersed in order to begin a ‘trip’ that lasts approximately 50 minutes. 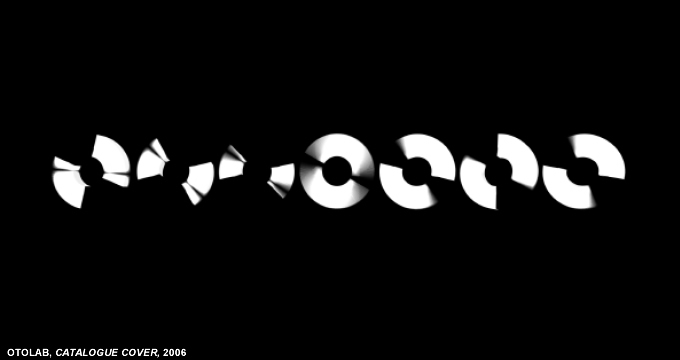 Otolab surprises us when the bidimensional flatness of the image on the screen is destroyed by moving often-three-dimensional visual elements. As for the theories of Masters Victor Vasarely and Mead Schaeffer, op7 begins when going beyond the flatness of the projecting surface, transformed in retinical strain, so as to reach a psychological involvement of the spectator. Otolab expands the process experimented by the above-mentioned Masters when, confident about the usage of new digital technologies, dissolves the screen and distributes perceptive stimulation in space. The work of art is not static any more and the movement is not only an optical illusion derived from the composition of the shapes. The work is, itself, a three-dimensional optical and audiovisual animation, distributed in a three-dimensional environment. The line, multiplying and transforming itself, becomes volume, thus an immersive trompe l’oeil. As shown by the prints in the exhibit, representing stills from the digital video material, able to project the spectator on a specific point of focus of a hypothetical electronic horizon. The concept behind op7 is precisely this research of an imaginary horizon, both visual and auditory. The almost physical and architectural project of the work is such that the optical stimulation is able to explore the limits of human vision. Beyond the modernist theory of the embodied subject, following the perceptive cathegories of the electronic body, otolab’s recombining culture allows the visual horizons in each of op7’s chapters to become focuses of ‘intensity’ and ‘flow’, as Gilles Deleuze and Félix Guattari theorized. Such audiovisual flow is the matrix behind the synaesthetic work in op7. Uninterrupted sounds and images whose sensorial perception may automatically induce a perception in a different dimension, in absence of a specific stimulation (Baron-Cohen & Harrison). The audiovisual synaesthesis and the profound level of sensorial immersivity that derives from it represent in op7, especially in ideal, multi-screen, spatialized-sound livemedia performance conditions, not a simple cross-modal metaphor but a proper audiovisual connexion, a higher cortical function according to the most updated theories of Richard Cytowic. In conclusion, going back to what mentioned at the beginning, it is exactly in the building of its performative component that op7 finds its most effective language, according to some of the most important project and contemporary artistic research parameters.